The new year is often a time of reflection and people usually feel that there are countless opportunities to do anything they desire. This is why resolutions are so popular this time of year, it is a wonderful fresh time to start something special. This freshness makes changing wedding cake trends seem natural and desired. 2016 wedding cake trends predict a spectacular year in cake design which merge retro and traditional looks with fabulous innovative styles. There is something for every type of couple in the 2016 trends, so let your imagination soar and create something unique and unforgettable. Buttercream instead of smooth fondant. Many couples are leaning towards taste rather than smooth finish with this trend. Naked: This was also a trend in 2015, filling your cake tiers but leaving the outside free of all frosting. Even cake layers and firm icing is key to create a professional look with these stark cakes. Texture, texture, and more texture: Ruffles, swirls, rosettes, piped flowers, and even waves will be seen on 2016 cakes this year. This trend will use every medium to create spectacular texture from piped buttercream to stiff gum paste ruffles. Metallic hues: Glittering gold, silver, copper, and bronze will adorn many cakes in the form of beading, piping, cut outs and even full cake coverings. Cookies, macaroons, and truffles: Choosing cookies and confections instead of cake can create a lovely whimsical feel to a wedding. Plucking pretty decorated cookies from a well constructed stack gives a casual feel to an event rather than a stiff formal cake. Blast from the past: Couples will be taking a page from the past with traditional wedding cake designs taken right out of the 1940s, 1950s and before. Often, these retro cakes are the actual design used by a beloved family member or admired in an old photograph. Flowers: Flowers remain as an all enduring wedding cake trend that goes on for decades. There will always be couples that want real and carefully fabricated flowers on their cake. These cakes can be completely festooned in blooms or feature a perfect single flower as a topping. Never out of style or favor. Vibrant, bold colors: Couples are not afraid to make a color statement at their weddings in 2016. These bold hues can be found all over the cake or in elaborate detailing in small areas of impact. Imagine a pure white unadorned cake with one bodacious fuchsia peony perched in the middle of the second tier. Pretty in pink: Pink is one of the most romantic feminine choices in the color wheel, and it will still be very popular in 2016. From the palest blush to deep, rich magenta, cakes will showcase this color. 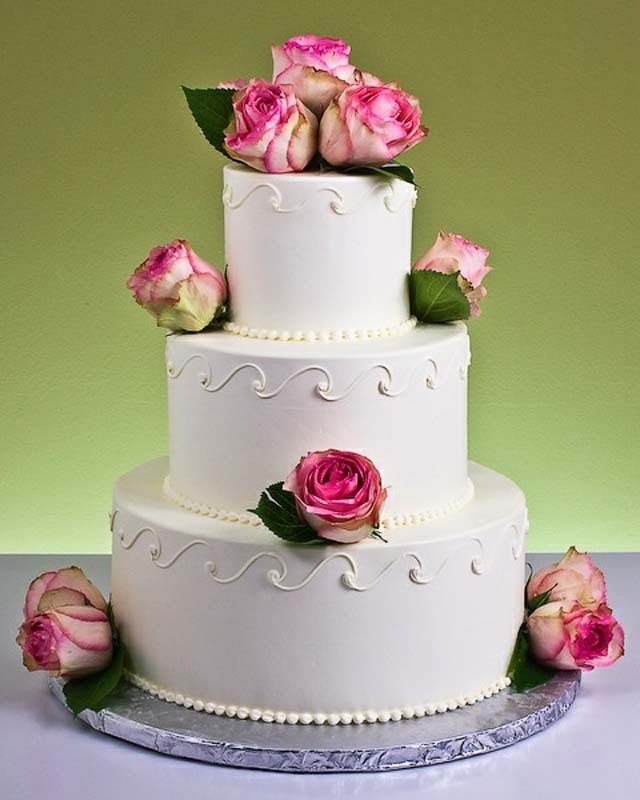 Pink wedding cakes also ties in with both traditional cakes and the trend towards bold, vibrant colors.